I am a post-doctoral researcher at the Collaborative Research Center 884 "The Political Economy of Reforms" at the University of Mannheim. In spring 2016 I spend 4 months as a Visiting Research Fellow at the Robert Schuman Centre for Advanced Studies and the ERC-Project "Willing to Pay? Testing Institutionalist Theory with Experiments" at the European University Institute in Florence. ​Previously, I studied sociology and economics in Leipzig (until 2009). From 2010-2014 I was a PhD-student at the Graduate School of Economic and Social Sciences (GESS) at the University of Mannheim. In my dissertation, I examined theoretically and empirically whether societal developments such as population ageing or financial crises affect the way how people form and change their attitudes towards the welfare state. My research interests are related to political sociology, comparative political economy, welfare state preferences, behavioural economics and survey methodology. One main contribution of my work is the use of innovative (experimental) research designs to study attitude change. I have contributed questionnaires to several waves of the German Internet Panel (e.g. repeated modules of project A6, GIP Reforms Monitor) and successfully applied for data collection in the LISS panel and the Norwegian Citizen Panel. Does mentioning its costs, i.e. 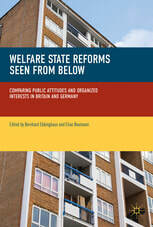 taxes, affect support for the welfare state? New article in Societies provides evidence from a series of survey experiments in the German Internet Panel. Naumann, E. Tax Constraints, Social Policy Preferences, and Support for Redistribution. Societies , 8, 46. Do right-wing parties forster welfare chauvinistic attitudes? New article published in Electoral Studies (together with Paul Marx) shows that welfare chauvinism increased markedly during the first year of the 'refugee crisis'. But this increase is not restricted to new radical right wing voters and we observe increased welfare chauvinism among supporters of all parties. How attitudes towards highly skilled and low-skilled immigration in Europe have changed. Does migration affect support for redistribution? New article in West European Politics shows that respondents with high incomes and those who face low labour market competition withdraw support for redistribution when faced with immigration. SFB 884 "Political Economy of Reforms"